Longtime fans like me spent years wondering whether the groundbreaking Mary Hartman, Mary Hartman series would ever surface on disc. Our hopes rose in 2007 when Sony issued a three-DVD package labeled Volume 1, which contained the first 25 shows. But additional volumes never arrived and I eventually gave up. Now, out of the blue, comes this mammoth collection, which delivers the entire series on 36 discs. As if that weren’t enough, the set includes two bonus DVDs featuring reminiscences from creator/producer Norman Lear; Louise Lasser, who aced the title role; and Mary Kay Place, who played her best friend, the unforgettable Loretta Haggers. Also here are 10 installments of the spinoff series, Fernwood 2 Night, a hilariously tacky, low-budget pseudo talk show starring Martin Mull as host Barth Gimble and Fred Willard as his clueless sidekick, Jerry Hubbard. But the main attraction, of course, are the 325 addictive episodes of Mary Hartman, Mary Hartman. (Check out the show-opening voiceover by Dody Goodman, who plays her wacky mother, to find out why Mary’s name appears twice in the title.) Lasser has suggested that people are wrong to call the show ahead of its time. In fact, she says, it was instead an excellent mirror of society when it first aired in 1976 and 1977 and it remains so today. I take her point, but as a television show, it was definitely a leap ahead when it debuted, and in some ways it still is. Though producer Lear couldn’t have been a hotter name when he proposed this series—he’d already hit it big with All in the Family, Sanford and Son, Good Times, Maude and The Jeffersons—he couldn’t find a network willing to take a chance on it. He finally had to put together his own network, pitching the show himself to independent stations nationwide and selling it in syndication. I take the PTA’s point, too. Mary Hartman rang true because it reflected so much of what we saw in our everyday lives—consumerism, sensationalism and absurdity are three words that come to mind. But what exactly was this show? It was too funny to be a soap opera, too serious and poignant to be a sitcom. There was no laugh track, but there were lots of laughs. It wasn’t quite like anything that had been seen before. And nearly four decades later, despite all that cable has delivered, it’s still in a class of its own. When friends ask me to describe it, I always struggle and wind up saying they’ve simply got to watch it to understand it. Consider the plot. A madman kills an entire family, not to mention its goats and chickens, and Mary learns that her beloved Grandpa Larkin has been arrested as the infamous Fernwood Flasher. Meanwhile, she grapples with two problems of seemingly equal import—waxy yellow buildup on her kitchen floor and an emotionally distant, impotent husband. And that’s all in just the first 22-minute episode. Stay tuned for a collision with a station wagon full of nuns, eight-year-old Reverend Jimmy Joe Jeeter’s drowning in a bathtub, his father’s Condos for Christ fundraising scheme, a football coach’s fatal encounter with a bowl of chicken soup, Loretta Haggers’s impassioned country music performances at the nearly deserted Capri Lounge and a whole lot more. It can take a little while to get sucked in and to understand just what Lear and his writing team are up to here. Lasser says even she didn’t “get it” until sometime after they’d shot two pilots. But hang in there. You’ll find that like The Honeymooners, Mary Hartman manages to shift gears effortlessly between hilarious and poignant moments. Mary’s season-ending 11-minute nervous breakdown scene, which was filmed in one take, may not be the best acting ever seen on television (as Lear believes) but it’s right up there with the finest. The other actors are virtually all first-rate—Dody Goodman is one of many who seems to have been perfectly cast—and the scripts are consistently as wonderful as they are wacky. And by the way, the final episode is just what it ought to be. 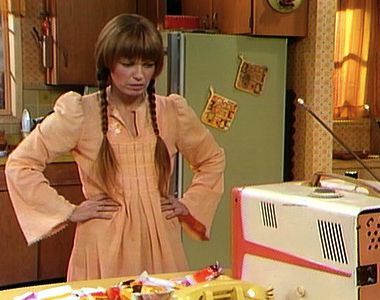 If you overlooked Mary Hartman in the seventies, don’t miss this second chance to see one of the greatest TV series ever broadcast. And if you did watch it then, do what I’m doing and watch it again.